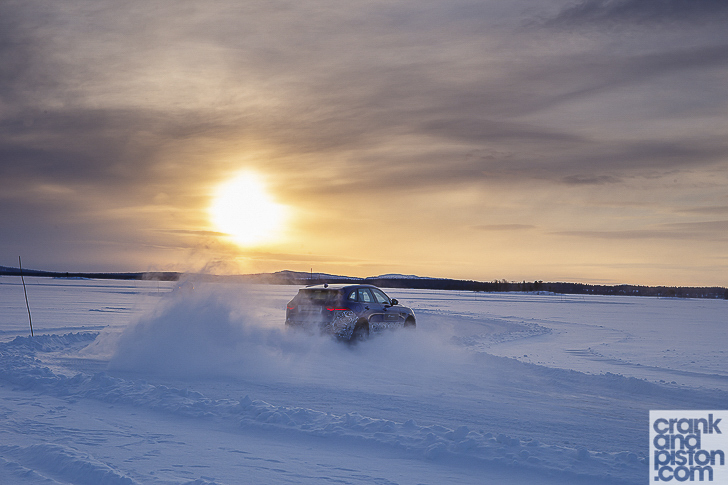 crankandpiston has swapped the sand and heat for Sweden’s sub-zero temperatures for a spin in the new F-PACE on a frozen lake. But will the expectation heaped on Jaguar’s first SUV in the company’s 71-year history be met? From concept to near-production trim, Jaguar’s design for the F-PACE crossover has hardly changed, such is the conviction the company has in its latest model. And that should concern rival manufacturers considerably. Though still comparatively young, the performance crossover market – for which the Porsche Cayenne became an immediate yardstick back in 2002 – continues to grow in both significance and stature across the world, and as such, every high profile manufacturer is jumping on-board: Bentley’s Bentayga SUV first appeared as the EXP 9 F concept back in 2012, production of Maserati’s Levante is just around the corner, and even Lotus and Rolls-Royce have announced an interest. It seemed inevitable that Jaguar would also take the leap, the F-PACE from an early stage lining up alongside the F-TYPE Roadster as figureheads for the company’s ‘new era’. 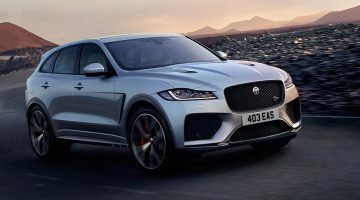 Indeed, speculation is already mounting that the first ever SUV in Jaguar’s 71-year history could quickly become its highest selling model, such is customer interest in the segment. And given its underpinnings, few would contest that. At the base lies the same platform found on the new and more performance-focused XE and XF saloons, and atop this lies 81 percent new components. A lightweight but structurally rigid build means a kerb weight starting from just 1665kg, considerably less than others in its segment. Meanwhile the all-wheel drive system has been updated and is heavily rear-biased to make the F-PACE ‘perform as a Jaguar should’. Prices for the newboy start from $48,800 placing it neatly into Audi Q5 territory, but Jaguar is aiming its new crossover squarely at the Porsche Macan, and benchmarks rarely come higher than that. JLR, whilst gunning for ‘unrivalled dynamics and everyday versatility’, has worked hard to polarise its two brands, focusing more on the dynamic ability of the F-PACE rather than off-road efficiency so as not to tread on its partners toes. Inevitably though Land Rover has crept into the F-PACE mix courtesy of a new All Surface Progress Control system derived from the Discovery’s All Terrain Response, but I’ll come back to that later. Which brings us to today. Now 71 years in the making, Jaguar’s first ever SUV is now a whisker away from being production ready, and we’ve managed to bag an early test at the Revi Test Centre just outside Arjeplog in Sweden. 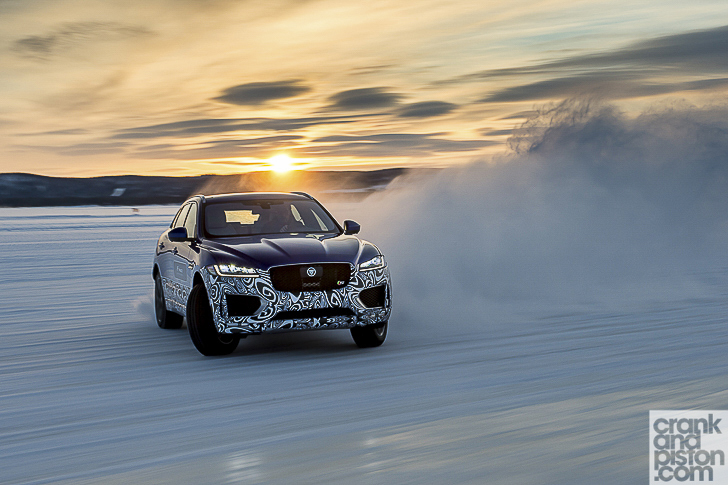 Four months out of the year when the Hornavan lake freezes over, chassis, suspension, tyres and powerplants alike are put to exhaustive test across four exclusive Jaguar Land Rover circuits, cut into the ice itself and with only 40cm of ice between the wheels of a near two-ton SUV and 221m of icy water. We’re 40km from the Arctic Circle, temperatures can drop to below minus-40 degrees, and the Revi facility spans nearly 60km. This is going to be good…. The heater in our R-Sport F-PACE test model is already set to ‘jolly high’ as the barrier in front of us raises, allowing access to the frozen lake. It’s just gone 9.30am, but the sun is not due to rise fully for another half an hour at least, the resultant blue tint lingering over the lake reminding us that it will only be around for four hours even when it does. Our genial Swedish hosts though, clearly amused by our multiple-layers of winter clothing, are quite cheerful, talking of ‘t-shirt weather’ given that the temperature has risen almost 20 degrees since yesterday. The -9 degree reading on the dashboard and the hole in my boot whistling icy air through two layers of socks suggests it’ll be a while before I’ve fully acclimatised. 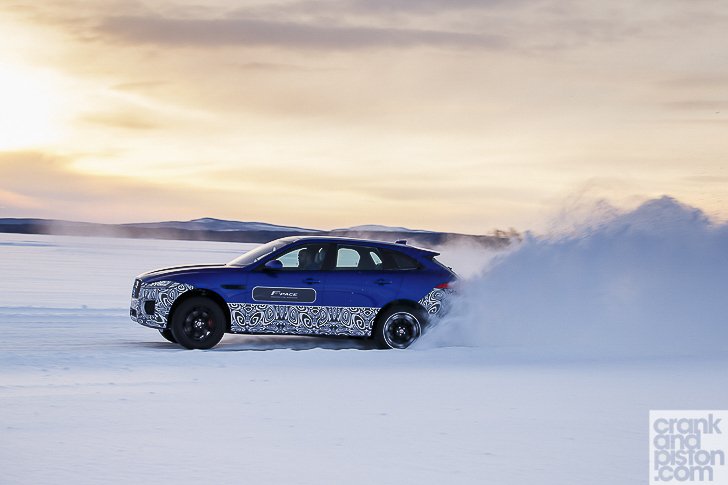 Not that the temperatures seem to be bothering the F-PACE, those recognisable headlights, muscular bonnet grooves and 22in alloys we saw on the concept now coupled with camouflage detailing around the bumpers and sills, another reminder that Jaguar’s crossover is still not in final production specification as its cracks its way onto the icy lake. Positively brimming with enthusiasm for his project, James dives right in, explaining the technical side of the Adaptive Surface Response we’re using, a system designed by people with letters after their names and diplomas from über swanky technical institutes, almost all of which, naturally, is completely lost on muggins here. In a semi-frozen nutshell, the ASR – first introduced in the new XF – identifies the surface under-tyre and maps both the powertrain and the dampers to offer maximum traction. Effectively too I might add, and onto my second lap, content that the nose is not about to sluice into a snow bank, I pick up the pace a little. Now at a positively dizzying 57kph, the ASR begins to assert itself. The effectiveness of the winter tyres is no doubt having an effect but traction is nevertheless superb on these slick surfaces. With 516lb ft of torque in our diesel-powered 3-litre V6 test model evenly spread across both axles and 296bhp being fed very gingerly to all four wheels, there’s barely any slip at all, this stability continuing to impress even as the speed increases. Saying that, there’s little weight to the power steering, confirmation that the technical underpinnings are keeping this machine on the road rather than me. A facet James demonstrates without warning by switching the ASR off. Power and torque are now being sent to the rear axle and there’s a noticeable difference. Throttle response is much punchier and inputs of speed sharper, while the steering weights up significantly: not enough to allay the 1884kg kerb weight, but enough to offer textured feedback from the front wheels, even on these slick surfaces. Out of seemingly each turn, the rear wheels now twitch as the power is fed and the tyres begin to slip. Not far granted, given the effectiveness of the traction control, but enough to add a dash of Jaguar spice. Heading into yet another lap, and James flicks to Dynamic drive mode. Acceleration offers yet more bite to proceedings, each tap of the throttle giving the rear end a kick and the traction control yet another reason to act as safety net. Though I’ll refrain from mentioning the plastic paddles, shifts through the ZF eight-speed automatic are seamless: not aggressive, just rapid, offering an almost gentlemanly refined manner of building momentum as we’ve found with Jaguars in the past. Saying that, I’m relieved that settings in Dynamic mode can be customized. Already the standard suspension setup has proven itself mightily capable in Normal mode, with little body roll affecting the cabin. Ramping the dampers up to their most ferocious settings though, rather than further improving the agility, simply makes the supple ride quality more jarring. With our F-PACE test model safely not in the trees (no ‘Gent Corner’, fortunately), I’m invited to spend 30 minutes aboard the 375bhp petrol V6 version on Revi’s drift bowl, a perpetual loop stretching half a kilometre. I would love to tell you about the Jag’s accessible nature on these surfaces, and the premium quality of the cabin that adds an air of refinement to proceedings, but honestly, I’m too busy grinning like a simpleton as I feather the throttle to keep the back end out. Even despite a white curtain enveloping the F-PACE as I fishtail wildly on a couple of occasions, it does begin to dawn – such is the ease with which the rears and power can be controlled – that Jaguar may have a point. Could this F-PACE legitimately take on the Macan? 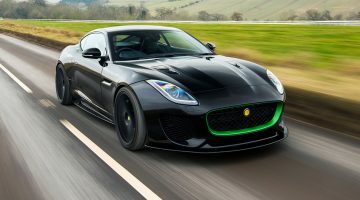 Lister Thunder review – is 666bhp too much?